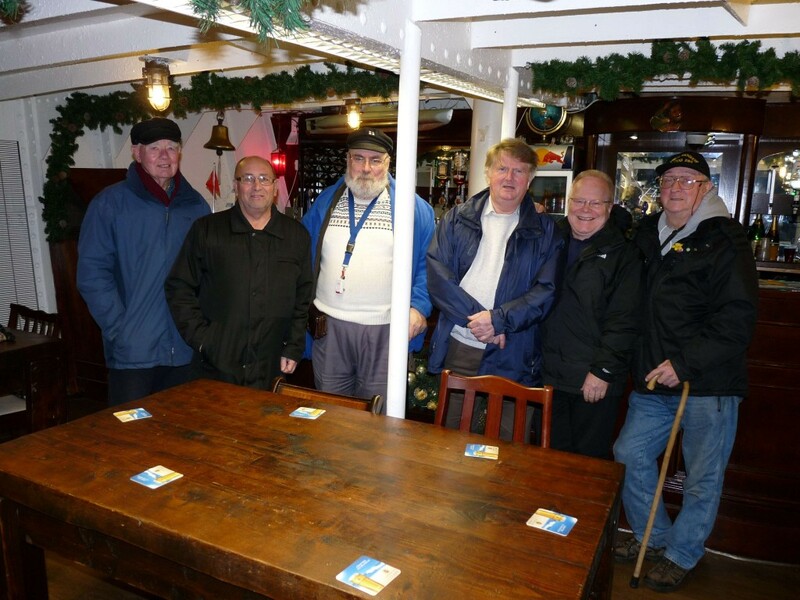 The inaugural meeting was held on board the Planet Light vessel in Canning Dock Liverpool on the 21st December 2014. After a four and a half hour journey from Hertfordshire, via Tintwistle to pick Mike Carter up, we arrived in Liverpool with forty minutes to spare before the two o’clock meeting, which had been arranged some weeks previously. The main agenda was to see if the venue ticked all the correct boxes in order to fulfil the licence criteria, and also to ensure that the vessel was a suitable choice for the month long event. That is the event has to be open to the public – as the Planet is a museum we are covered, it was also found to be more than adequate for the ROA event. In fact with the smell of the diesel generator running, and the soft swaying at the quay along with the vibration from the machinery spaces you could imagine being back at sea, I wish!! 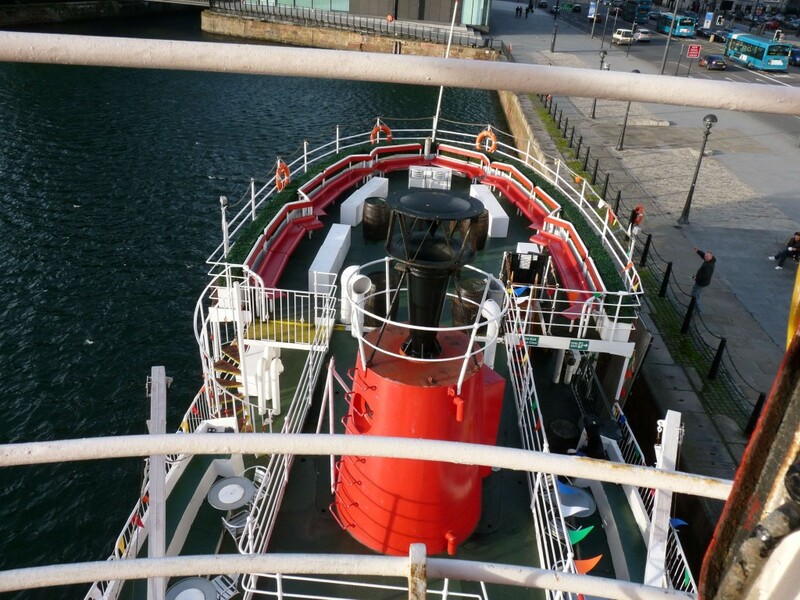 Prior to starting the meeting Mike and I were shown around the light vessel, the owner has done her proud, a riveted vessel she looked as though she had come out of the builders yard, resplendent in her new coat of red paint. Inside lots of refurbishing work had, and was still in progress of being carried out. Her cabins are being rebuilt so that she can accommodate bed and breakfast guests, as well as a well stocked bar and cafeteria area. Mike and I were then taken to the main Amateur operating position, which is situated just below the large light, really well situated and easy access for visitors to be shown around. The position of the second station which will be up and running prior to the start of the Lusitania event will be positioned in an aft cabin, with easy access for co-axial cabling to be connected to the vertical aerial which will be used. the main station uses a WD3ZZ aerial. 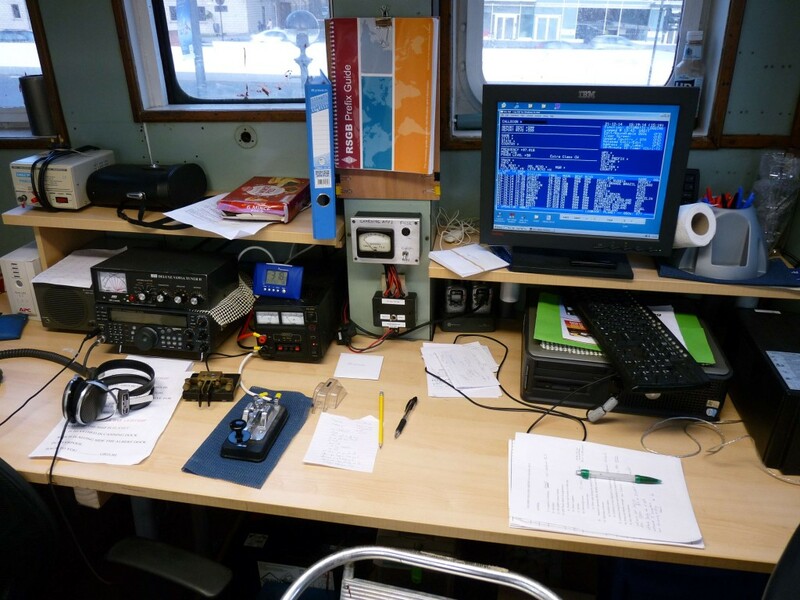 The ROA from Liverpool are also members of the Museum Radio Maritime Society (MRMS), they have invited the ROA to use the vessel for the Lusitania event, and for which we are very grateful for. There are a few points that need to be ironed out firstly, the main problem is the diesel which the generators on board consume on a daily basis, it is hoped that a smaller generator can be repaired which will reduce the diesel usage and thus the costs. Mike Carter has a marine engineer colleague, retired, who is going to try and get this unit functioning again. Further information will be added to this page when available. Looking aft from under the Light. L-R Stan McNally, Alan Waddington, Bill Cross, Mike Carter, Clive Evans and Bob Bunker.